Bronwyn is a Melbourne based printmaker who has a studio at the Fire Station Print Studio. Bronwyn’s unique mark-making produces energetic, vibrant prints and artists books. View her work: facebook or Instagram, Queenscliff Gallery website inc images from similar workshops of hers. 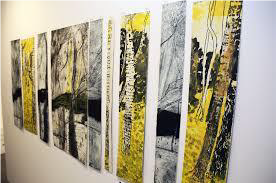 A fun, multi-faceted workshop encouraging play and experimentation, exploring a variety of mark making processes to overprint and transform your old prints/ proofs, drawings, found papers and materials. Or start something completely fresh! You will work towards creating beautiful objects and structures, delving into the realm of creating artists books, learning construction and binding techniques and ways of communicating your ideas with purpose. Suited for all abilities and backgrounds, of particular benefit for those who lack confidence working with a variety of media and techniques AND for those who are new to creating artists books or who want to push boundaries and be inspired! These workshops are available to fully paid up PCANZ members. Strictly limited numbers. o Cheques: post to The Treasurer, Print Council Aotearoa New Zealand, 81 Mount View Rd, Whanganui 4500. NO COURSE REFUND AFTER THIS DATE.